Teiid Embedded is a light-weight version of Teiid, it contain an easy-to-use JDBC Driver and an embedded the Query Engine. The Embedded mode supply almost all Teiid features without JEE JBoss Container involved. So for Debug source code purpose, there is no reason to set up Debug environment in JBoss Server. https://github.com/teiid/teiid-embedded-examples have several examples which can help you set up a debug environment quickly. By default, QueryProcessor assume the TimeSlice between RequestWorkItem and QueryProcessor are 2 seconds, if the time exceed 2 seconds the ExpiredTimeSliceException will throw, so set a larger TimeSlice is a prerequisite. 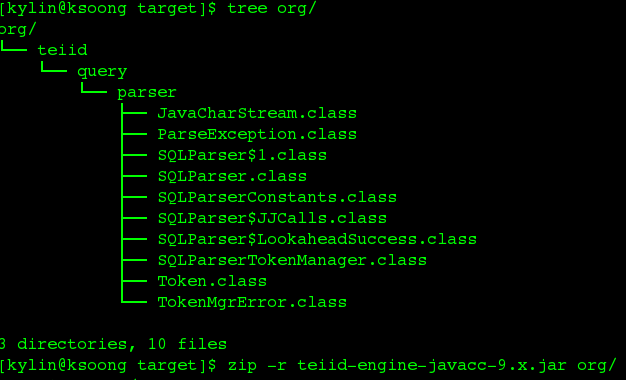 As above figure, teiid-engine-javacc-9.x.jar will be generated, add it to classpath. RequestMessage as parameter be passed from client which wrapped a sql command, ResultsFuture (wrap a ResultsMessage) will be return at the end of this method. teiid-mind-map ‘Statement execute Query’ section has a mind map which can help to debug the engine. NOTE: With -Dreplace_expected=true option in above junit test can quick fix integration test failure if the system schema have be changed.